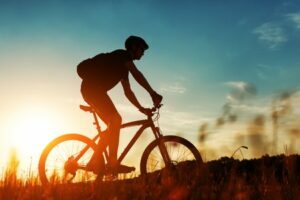 Riding a Bike Offers Some Great Health Benefits! Riding a bike can be a lot of fun. So much fun, in fact, that you might forget how good it is for you! There are a range of positive health benefits that come along with riding your bike regularly. Let’s take a look at a few of those benefits below. There aren’t many exercises that will effectively target the majority of your major muscle groups, but cycling is one of them. When you ride a bike, you will work out everything from your arms and legs to your core and your back. You won’t necessarily feel the burn at all time—except maybe when you’re chugging up a hill—but the cumulative effort of riding a bike can be beneficial for a variety of different muscle groups. Like cycling, running can also target a number of major muscle groups. Cycling is a low impact exercise, though, which means it won’t put much as much stress on your hips, knees and ankles. This can reduce the risk of injury and allow you to enjoy all the benefits of regular exercise. In addition to exercising your muscles, cycling will also get your heart pumping and your blood flowing. Taking several bike rides a week can improve your cardiovascular health dramatically, making you feel stronger and more resilient throughout the day. Does your bike need a tune-up so you can get back on the road? Stop into our service shop today to speak with a mechanic!